YA writers are smart chicks. We all knew that, but now a group have gotten together to create an anthology to build upon the “Smart Chicks Kick It” tour. GCC Member Jeri Smith-Ready has one of the more notable short stories in this paranormal anthology, titled ENTHRALLED: PARANORMAL DIVERSION, out this week through HarperCollins. 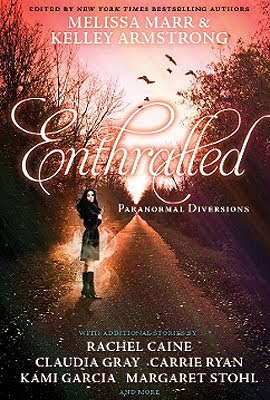 ENTHRALLED: PARANORMAL DIVERSION is a collection of original paranormal YA short stories edited by Melissa Marr and Kelley Armstrong. It grew out of the 2010 Smart Chicks Kick It Tour, a multi-author, multicity, author-organized tour of the US and Canada. Now, these 16 authors hope to bring a little taste of the Smart Chicks experience to readers everywhere. Jeri Smith-Ready, a member of the tour, contributed the short story, “BRIDGE.” “Bridge” is a story, told in free verse, of how two brothers, with the help of a stranger, forge the chasm between them to find a lasting peace. In the story, exists the world of the SHADE novels, where everyone seventeen and under can see and hear ghosts, but no one else can. So when Logan Keeley dies and his eighteen-year-old brother Mickey blames himself, they can’t ease each other’s pain or reconcile their rage. Over the course of SHADE and SHIFT, Mickey sinks into a near-suicidal depression over Logan’s death. Jeri: No, thank goodness! It was hard enough to wait five years from the time I started writing seriously until I was published. I can’t imagine waiting and wanting something so bad my entire life. When I was little, I wanted to be a veterinarian. Q: What did you do for your Sweet 16 or Quinceañera? Jeri: Oh, I…really shouldn’t say how I spent my sixteenth birthday. That’s one for the vaults. Jeri: Each book is different, but I usually have a rough outline/synopsis before I start. Then I never look at the outline while I write the first draft. It’s when I rewrite that I get super analytical, using spreadsheets and index cards and programs like Scrivener. But first drafts are usually organic, especially if it’s the first book in the series. Q: Where were you when you found out that ENTHRALLED was going to be published? Tell us the story. Jeri: I don’t remember where I was when I found out there was going to be an anthology of authors on the Smart Chicks Tour, but I remember I was in my office when I got the email from Melissa Marr asking me to take part in the tour. I think they could hear me scream clear across the Mason-Dixon line. After I (calmly and professionally) accepted, I emailed my agent, who wrote back a very happy sentence in all caps, a sentence that cannot be printed on a family-friendly blog. Thank you, Jeri! Now, everyone go out and buy books, lots and lots of books!